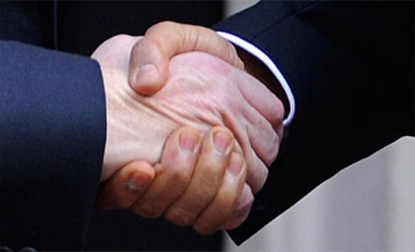 Rediff.com » Business » M&As can negatively impact workforce, is there a way out? M&As can negatively impact workforce, is there a way out? Mergers are not just about balance sheets or marketing synergies; they are also about those who make the synergies real, says Shyamal Majumdar. A new chief executive officer (CEO) takes charge and makes pious statements about how he wants to take everybody along and how he would like to benefit from the wisdom of the existing top team, which has led the company from the front for so long. A few months later, the scenario is usually very different - most members of the top team have been politely shown the door. "Too many CEOs join a company with a preconceived notion that the existing lot are either incompetent or so loyal to his predecessor that they will conspire against him," says an HR consultant. The same game is often played out after merger and acquisition (M&A) deals. The top managements of the acquired companies usually find themselves at the receiving end for their perceived incompetence. There are examples galore, the latest being Ranbaxy which has reportedly seen over 150 senior-level exits after Sun Pharmaceutical Industries Ltd first made the usual noise about taking everybody along and then deciding to fill several crucial slots with its own people. It's not that all of them have been forced exits - some left as they were not comfortable with the new scheme of things while some others didn't fit in with the new owner's game plan. But what most companies underestimate is the ripple effect such an exodus can have on people down the line after an M&A deal. Employees who are left behind after such layoffs are left grappling with increased workloads, a sense of uncertainty about their own future and the loss of institutional knowledge. The latter is important as you need people with knowledge of the way things are done in the acquired company. Thinking that everyone is an idiot or is a barrier to change and hence, one has to wield the axe is one of the main reasons why very few M&A deals work. That's why the term "inclusion" is popular in leadership seminars. Take Nelson Mandela, for example. Instead of the widely expected retribution and war-crime trials from South Africa's post-apartheid government, Mandela gave South Africa a unified government that included parties which supported his imprisonment and sanctioned the torture he went through in his one-time prison cell on Robben Island. His government also set up a Truth and Reconciliation Commission. Former US President Bill Clinton captured this aspect of Mandela's leadership beautifully in a speech on leadership. Mandela, he said, left the structure of the government intact as long as people were willing to work with him to achieve the objectives of the country. In the speech, Clinton also recounts a conversation he had with Mandela about the latter's decision to include people who had tortured him for so long. Mandela's answer, Clinton said, made him believe that to forgive is not just to be altruistic; it is also the best form of self-interest. Mandela told Clinton it's fine his party won 63 per cent of votes, but given that "we just voted for the first time in 300 years, can we run banks, the military, the police all by ourselves? The answer at this point is we can't; so let us be pragmatic". This approach of partnering is something companies often forget in their misplaced enthusiasm to get rid of people in the acquired entities, as a result of which M&As frequently result in disgruntled employees and an exodus of top talent. This is precisely the problem that grounded America's largest merger - the AOL-Time Warner deal in January 2000 - that created the biggest company in the world. Ignoring what McKinsey has famously termed "the people problem in mergers", resulted in a clash of cultures that set the stage for a spectacular corporate collapse. AOL executives lorded it over their Time Warner counterparts, who felt they were being acquired by brash, young interlopers with inflated dollars. The AOL way was fast, loose, and aggressive, and Time Warner executives - schooled in more genteel business practices -rebelled. In the midst of clashing cultures and conflicting management styles, AOL's business slowed and then stalled. HR consultants cite this example to say that people in charge of acquiring another company often forget that mergers are not just about balance sheets, cash flows or marketing synergies; they are also about people making the synergies real.